Ever watched a politician answer a question that left you none the wiser? Have you seen them give the same non-answer over and over to a completely different set of questions? Do you read newspapers and quietly wonder what on earth they are on about? You’re not alone. 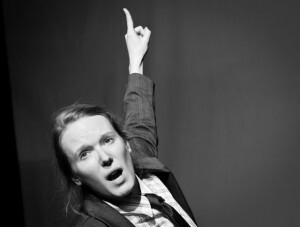 Award-winning writer and performer Hannah Silva delivers her own manifesto that satirises the meaningless twaddle and jargon of modern political language. Audiences become delegates at a party conference with a difference. Blair’s bluster gets busted, Churchill butts in on Obama and Cameron’s Big Society gets sliced and diced with live twitter feeds, weather reports, rant and rhetoric in a fast-talking, funny, razor -sharp performance that will make you question your right to free speech. Immaculately choreographed and brilliantly performed. Hannah Silva was captivating throughout. Political theatre at its best, funny and relevant! It was great to have crowd participation…breaking the fourth wall, the surreal nature of the performance worked. Loved it, very, very skilled performance, Hannah has a fabulous stage presence, brilliant piece, would not be out of place as a TV stand up show! Feels like I’ve waited an age for a piece that used contemporary political and Big Society jargon as its referent. Opposition was originally co-produced with The Barbican Theatre in Plymouth through ‘Flourish’. It was re-developed in Residence at Dartington Space with support from the Dartington Hall Trust. In association with Apples and Snakes. Funded by the Arts Council England and the Arts Unit, Plymouth City Council.